Welcome to Post-weekend Poetry and the twentieth poem in this series. 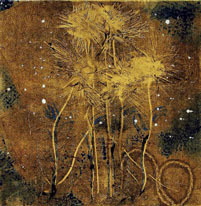 This week’s piece is by poet and artist Lesley Fletcher. As the bottle gathers wax. Well-worn cushions of the couch. And the flame again ablaze. Inspiration Import is the name of the company I set up many years ago without knowing exactly what I would do with it. I just loved the word ‘inspiration’ and of course the ‘import’ part is the vessel which brings the inspiration to me. I have always maintained that my inspiration has come from my art but I realise that this is somewhat of a cop-out. It really comes from my heart. I am a bit of a headline reader and sometimes scattered in many directions but if something touches my heart as far as humanity is concerned it sticks and stays. Many of my stories are experience-based (with) a bit of research and a lot of listening. When I say listening, I mean not just listening to words but to nuances and to emotions. If I am able to provide a piece of art or a story or poem that has the ability to evoke a strong emotional response that further lights my desire, and imagination to write. Lesley Fletcher is a self-taught artist who realised later in life that her calling was in the field of writing books and producing art with the emphasis on printmaking. 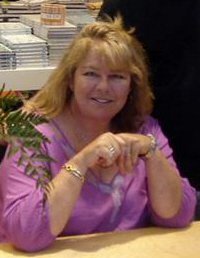 She has published three fully illustrated children’s / young adult books and currently working on a fourth which will also provide space for her various types of art. The books and all their illustrations both interior and cover work are Lesley’s art. Her upcoming book, ‘5 Pillars of the Gypsy’ is a combination of art and verse; it being her first book for adult audiences. Over the past three years she has managed two trips with Habitat For Humanity; one to Tajikistan and one to Jordan. Each of these trips included short stops in Istanbul. As a result she became interested in and had the privilege of learning about Islam and its parallels with Christianity along with cultural customs. As a volunteer with Literacy Unlimited and Friends for Mental Health, Lesley supports and encourages education as a way to break barriers, through knowledge and understanding. As an adventurous laid back spirit she is very adaptable to a variety of enjoyable experiences and takes delight in every one of them. Lesley Fletcher can be found on Twitter @gypsyles, LinkedIn, Google+, at her website, http://www.lesleyfletcher.com, and welcomes making new friends in our ever-changing world. The blog interviews will return as normal tomorrow with romance suspense author Alexa Bourne – the three hundred and sixty-third of my blog interviews with novelists, poets, short story authors, bloggers, biographers, agents, publishers and more. A list of interviewees (blogged and scheduled) can be found here. If you like what you read, please do go and investigate further. And I enjoy hearing from readers of my blog; do either leave a comment on the relevant interview (the interviewees love to hear from you too!) and / or email me. Thanks Morgen – Once again! 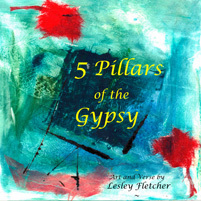 Since this poem was submitted ‘5 Pillars of the Gypsy’ has been published and as of this morning has 4 – 5 star reviews on Amazon. ‘The Flame’ is still at the top of my own favourite list and can be found in the book. Yes the blood bath was a reflection of my darker side too!